Ultrasonic has been used for a cosmetic purpose since the early 1980’s. Because of its wide therapeutic use and the great results, the ultrasonic instrument is a natural for use in skin care treatments. The Ultrasonic Skin Scrubber is the new generation of microdermabrasion or what is being called soft peeling. There is little to no redness or downtime with this treatment. This unit offers ablation or retexturizing results with the safe and gentle use of ultrasound vibration of up to 28,000 cycles per second. Strong ultrasonic vibration, generated at the tip of the scrubber, causes the lavation water to get mix with sebum, toxic substances, bacteria, cosmetic residue, etc. And then strong vaporization will remove the horny substances, sebum etc. 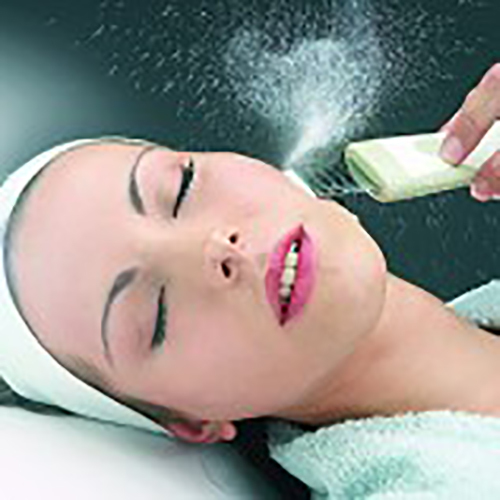 Enjoy ultrasonic cleansing and revitalization. Resurfaces the skin and loosens impurities. Ultrasonic technology is absolutely safe.